The Springsoft dosing/chem feed system is the solution for extreme sulfur and iron that exceed the capabilities of standard filtration. These systems are also the answer for iron and sulfur bacteria. Your Springsoft dosing system has many features not always found on standard chem feed systems. A water meter (similar to a municipal meter) is used to assure proper dosing. This proportional dosing system is an upgrade to standard flow switches because dosing is based on variable flow rates, as dosing requirements are different when filling a large tub than a water glass. This meter can also be used to monitor your water usage. Based on your water test, a precalculated solution mixture will be established to mitigate guesswork and trial and error. A large retention tank is used to assure proper contact time with the injected solution. This retention tank also allows percipitant to settle at the bottom of the tank so it does not enter the water supply. At scheduled intervals, this particulate can be flushed to drain. Residual solution and taste and odor filtration is accomplished by a special media filter. This filter automatically backwashes at periodic intervals. The dosing/chem feed system is generally installed after the pressure tank before water is distributed to the water supply. Any water lines that are currently plumbed as untreated will remain untreated. 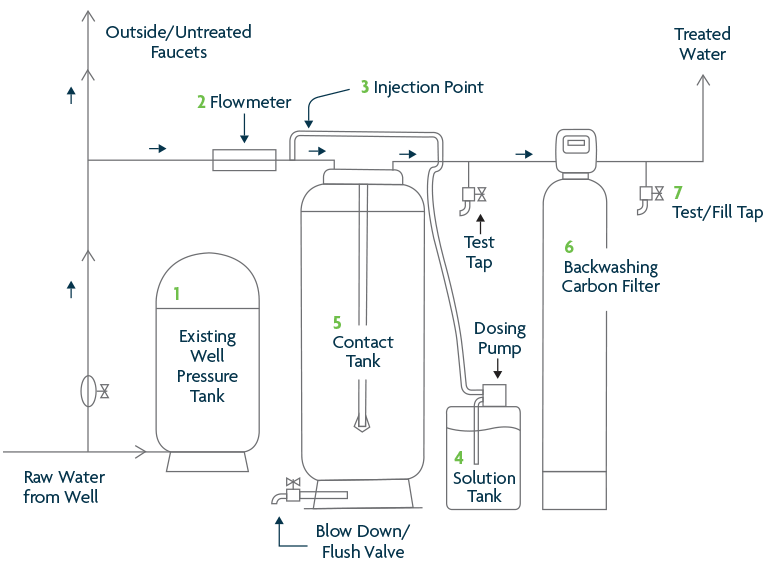 This system may be designed to use chlorine or hydrogen peroxide. 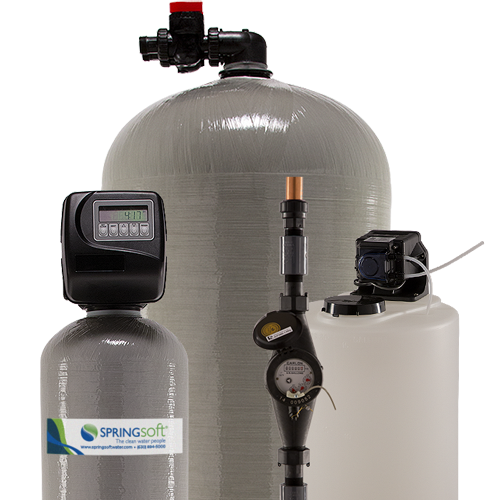 Your Springsoft water specialist will assist in providing the best option for your application.